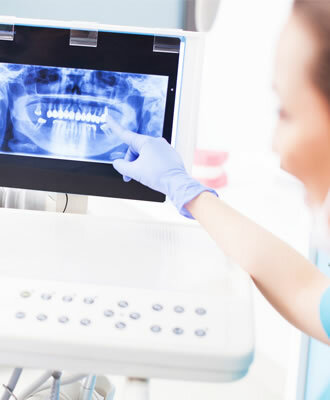 Laser dentistry can provide you with the latest advancement in dental care by eliminating much of the discomfort, promoting lesser bleeding, and shortening the recovery time associated with the traditional treatment methods. Dr. Horiyat and her team of periodontists uses Hi-tech laser technology at Aria Dental of Mission Viejo. Aria Dental offers various modern lasers for patients for different purposes: One is LANAP®, which is the first and only FDA cleared laser to treat moderate to severe periodontal disease and receding gum painlessly. Only 25% of dentists nationwide have this laser available for their patients. The other one is DIAGNODENT laser system, which is used for mild to moderate gum treatment. Nothing compares to modern laser treatment in Mission Viejo near Ladera Ranch and Laguna Niguel. For innovative, gentle, progressive gum treatment, please (949) 364-9600 or today. Dr. Horiyat and her team of board-certified periodontists utilize hi-tech laser to perform a range of procedure, including many hard and soft tissue procedures. PERIODONTAL CARE: Dental laser can provide vital periodontal treatment. During the laser procedure, your dentist will apply a tiny laser fiber between your teeth and gum. The energy released from laser will remove bacteria, which will allow your gum to regrow and reattach to your healthy teeth once more. COSMETIC GUM CONTOURING: If you have a gummy smile or an uneven gum line, our periodontists can use laser to reshape your gum line to optimal shape. GINGIVECTOMY / GINGIVOPLASTY: Laser is used to remove or recontour excessive gum overgrowth resulting in gummy smile, gum inflammation and redness, and occasional discomfort to give you better and healthier gum. COLD SORE TREATMENTS: Laser can be utilized to minimize cold sore appearance and redness, speed up cold sore healing, and reduce the chance of recurrence. FRENUM OR FRENECTOMY: a frenum is a naturally occurring muscle attachment, normally seen between the front teeth or under tongue, which can result in gap teeth, gum recession, or difficulty in speech. The excessive frenum can simply be removed by laser therapy. TOOTH RESHAPING: If you have slightly irregular teeth, our periodontists can use a laser to trim your dental enamel, which can create more balanced smile. CROWN LENGTHENING: If you have a tooth that has broken at or near the gum line, our skilled dentists can recontour small amount of gum and bone tissue to allow better placement of a crown.